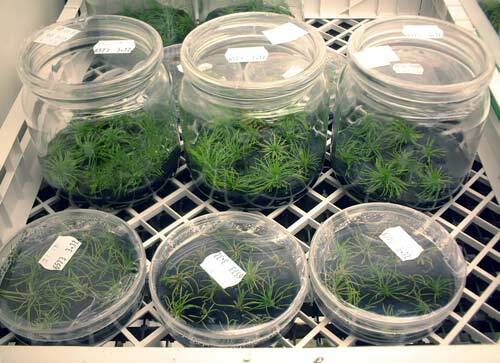 Thousands of genetically identical radiata pine trees can be produced using cultured tissue. When seed embryos are placed on a special growing medium in a Petri dish, they develop many little shoots. Each of these shoots can be cut off, grown and induced to form roots. The little plants are then transferred from Petri dishes to pots in a glasshouse until they are large enough to transfer outside to a nursery.